Sweet Lulus is the first fast casual restaurant I ventured into years ago. Once I started working in Toronto’s Financial District, I needed a lunch venue that wasn’t a food court, but we could finish a meal within an hour and under $15. Based on the advice of a co-worker, we visited Sweet Lulus and the rest, as they say, is history. 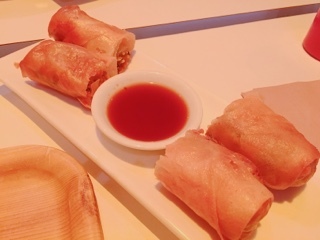 Although the vegetarian spring rolls ($5) arrive blistering hot, I wish they would have taken two minutes to properly shake off the excess oil so it wouldn’t pool on the plate and completely soak through a napkin … only to still leave a greasy coating throughout the starter. If the spring rolls were wrapped together or incorporated more filling, perhaps this would have been enough to keep all the oil out. Sadly, the poor craftsmanship and meagre cabbage, carrot and bean sprout filling made every bite an oily mess. From now on, I’ll skip the appetizers and just stick with the mains. In reality, you likely won’t need a starter as Sweet Lulu’s portions are pretty generous. 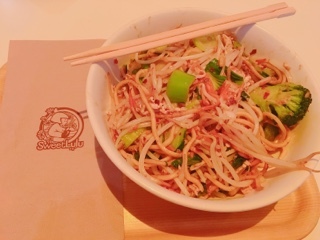 The stir fried noodles (ranging from $9.95 - $15.70) always satisfy with four noodles, four sauces, and various toppings to customize to your tastes. I find the thinner noodles, such as the rice stick and wheat, go better with soup (their Tom Yum base is decent), while thicker Hokkien ones stand up better to the flavourful sauces used in a stir-fry. My go to combination is either the vegetarian ($9.95), chicken ($11.95), or beef ($12.45) with Hokkien noodles, hot Thai sauce, crushed garlic, and sweet basil. The hot version is still relatively tame, so if you like it really spicy add the crushed chili flakes and grab a bottle of hot sauce from the front. For me, I find it has enough heat to meld with the savoury sauce and slight refreshing sweetness of the basil. 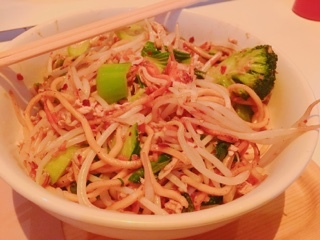 Plus, there’s always plenty of vegetables (broccoli, Shanghai bok choy, bean sprouts, carrots, and onions) tossed with the chewy noodles so there’s a bit of topping with every bite. 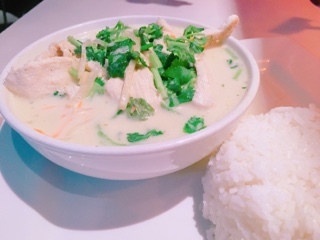 Although not terrible, the green curry chicken with steamed rice ($11.95) needs to be spicier and could use more coconut milk. I understand, it’s made in large batches and hence needs to be “safe” for the majority of customers. Unfortunately, the milky curry doesn’t lend itself to adding chili flakes or hot sauce into in order to make it more flavourful. Overall, let’s call this green curry for beginners. As the prices have risen and competitors such as Thai Express have entered the fold, Sweet Lulu’s notorious lines have thankfully decreased. Nonetheless, to get a seat at one of the 40ish dine-in spots, you’ll want to arrive before 12:30. After eating at Sweet Lulus for years, it still continues to satisfy. Their model of ordering at the cash register, getting a number to bring back to your seat, and then your meal gets delivered to the table is now widely used across the city – seven years ago, it seemed like a genius idea.